"How do you have my fingerprints?" "...Also, I got the fingerprint impressions out of the chunks of my armor you crushed with your bare hands." More like 'bear' hands, eh? I'm honestly a bit impressed that Batman managed to keep his cool when Wonder Woman claimed NOT to squeeze solid objects hard enough to leave fingerprint impressions. But then, of course he did. Oh ho... Waller's been possessed. Highly amusing, and so damned ironic. Interesting. So Waller is being used to bring Argentina into the war on the Axis's side by having America invade them militarily. Sidenote, FDR is President in this verse, correct? I'm curious how his policies contrast with the ugly side of the US that's necessary for DC universe stories to work. Was FDR a major official in Gotham back in the day instead of New York? That would probably change his personality a lot, or Gotham would probably be majorly different if he was in charge of it. BTW, regarding your Assassin's Creed ideas, I'd point to the Order of St. Dumas. They seem to have the most in common, theme wise, with the Assassin's Creed series. FDR was a generally benevolent politician, perhaps, but he wasn't a saint. I have no problem imagining him approving the idea that the military has someone like Amanda Waller running its counter-superpower efforts, in a world where that's a thing. The question of FDR's relationship with Gotham instead of New York (and for that matter Teddy Roosevelt before him) is an interesting one, though, yes. I meant more a United States that would work to better the nation and make New Deal style programs, as opposed to a US in the DC universe that always seems on the verge of falling apart or becoming a totalitarian state from sheer ineptitude and corruption, and it's only through heroes like Superman, Batman, Wonder Woman, etc., that keep it from becoming a nightmare. Yes, Gotham state replaces the existence of New York state, so there are countless ripple effects. One could second-guess every impact New York has had on history (Is "Broadway" still the foremost American theatrical style or is it named after some other street? Does Niagara Falls even exist?). If I had far more free time, I would happily expand a more complete alternate timeline of the setting - a complete DC 1939 almanac - but I don't have the time. For now, I'd encourage the reader to presume real history unless otherwise stated, and to take the fewest creative leaps to bridge any unexplained differences*. As for FDR, I believe he was a state senator from a rural county, then Assistant Secretary of the Navy, then Governor, then President. While he surely did business in NYC, it was never his official jurisdiction as a local official. I don't believe I claimed Gotham City was the state capital. And even if FDR was from the city, this new history does not change the averages of human behavior**. Gotham politics already has its share of Rooseveltian types, and some Tammanys, and some Nixons, and some William Jennings Bryans. This is not the Gotham City of certain fiction where literally everyone belongs in a circus or a strait jacket. A Teddy Roosevelt on the streets of Gotham, though. That would be interesting. I've heard of the Order of St. Dumas. From what little I know, they might fit the shoes, but we know so little about them compared to some other groups with more back-story. In some ways, yes, the US is under more conspicuous threat in this 1941 than our own, but not on any apocalyptic level (not yet, anyhow). The New Deal is implemented here, with largely the same consequences. Recall that Batman is only a few years old, and Gotham has endured waves of dysfunction for generations. You could argue this proves just how resilient the city is without Batman. In fact, Gotham is presently enjoying a period of historically low street crime, a trend that started before Batman. Furthermore, Batman's main goal in this story may ruin that for everyone. I don't explore this in the story, but a major theme of this alternate history is Gotham's dysfunctions prevent it from holding the same enormous financial, intellectual, and cultural preeminence New York City enjoys (recall the demolished stock exchange). Gotham is still America's number one city in clout and by some economic measures, but the enormous investment and creative energy is more evenly spread across the nation, meaning Gotham has a few challengers for "best" city that surpass it in some way, and there are a dozen more mid-rank cities that people actually care about. Contrary to falling apart, you could argue that this DC world has more redundancies. Side note: this dynamic is my excuse to neatly explain the "extra" cities of the DC world, many of which I've name-dropped in the text (Hub City, Fawcett City, etc.). If each major hero needs their own city (not an iron law, but a common trend), each of those cities better have something interesting going on. This spreads the interest sauce across more locations. Otherwise, you either have a distracting level of "big fish - little pond", where mighty demigods are fighting over a KFC in East Tumbleweed, or you get Marvel Syndrome***, with two dozens big characters sharing one city, which is limiting from a narrative perspective, I'd argue, and no one is paying attention to other 95% of the country. * The one exception: if someone is bold enough to write their own piece in the Batman 1939 canon, they can invent any explanations they want, and I'll support it. Theodore Roosevelt was a Republican in the New York state legislature in the 21st district from New York County (here, Gotham County or the equivalent thereof) in the 1882, '83, and '84 sessions. He was the Republican minority leader in 1883, and served as Chairman of Affairs of Cities in 1884, writing more bills than any other legislator. he was widely regarded for his anti-corruption efforts, to the extent that even though his district voted Democrat for governor (electing Grover Cleveland), it kept voting him in. He retired to be a rancher for a while, then got mildly involved in politics, then got an appointment to the US Civil Service Commission, where he was about as vigorous and active as elsewhere. William Lafayette Strong, a reform-minded Republican, won the 1894 mayoral election and offered Roosevelt a position on the board of the New York City Police Commissioners. Roosevelt became president of the board of commissioners and radically reformed the police force. Roosevelt implemented regular inspections of firearms and annual physical exams, appointed recruits based on their physical and mental qualifications rather than political affiliation, established Meritorious Service Medals, and closed corrupt police hostelries. During his tenure, a Municipal Lodging House was established by the Board of Charities, and Roosevelt required officers to register with the Board; he also had telephones installed in station houses. "When Roosevelt read [my] book, he came... No one ever helped as he did. For two years we were brothers in (New York City's crime-ridden) Mulberry Street. When he left I had seen its golden age... There is very little ease where Theodore Roosevelt leads, as we all of us found out. The lawbreaker found it out who predicted scornfully that he would "knuckle down to politics the way they all did", and lived to respect him, though he swore at him, as the one of them all who was stronger than pull... that was what made the age golden, that for the first time a moral purpose came into the street. In the light of it everything was transformed." Roosevelt made a habit of walking officers' beats late at night and early in the morning to make sure that they were on duty. He made a concerted effort to uniformly enforce New York's Sunday closing law; in this, he ran up against boss Tom Platt as well as Tammany Hall—he was notified that the Police Commission was being legislated out of existence. Roosevelt chose to defer rather than split with his party. As Governor of New York State, he would later sign an act replacing the Police Commission with a single Police Commissioner. Then he went back into national politics for a while, blah blah Rough Riders blah blah San Juan Hill, came back and ran for governor of New York in 1898, won handily, and served until pulled for the vice presidential ticket in 1900. So if we do a straight-up substitution, then if you're a Gothamite over 55 or so, then you remember that brief shining moment when TR ran the Gotham City Police Department. Did you have any ideas about where Metropolis is, by the way? It's "big" enough that it should arguably replace a city rather than deleting it. I'm tempted to say maybe St. Louis? Or is it a seaport city? I'm not wed to this idea, but I've often thought Metropolis should be in Kansas. The state is conspicuous; among the strong DC tradition of unspecified or fictional locations, Clark Kent grows up in an actual recognized state. Granted, Batman got started in New York if memory serves, but the Kansas idea survived to present canon. Why put Metropolis there? I've long held the hazy impression that in many Superman stories, our hero and his pals visit Smallville from Metropolis in what seems like an afternoon (maybe old episodes of Lois and Clark?). Ignoring the deep nerd math involved in speculating Superman flight speeds, some of these trips occur by car, so it would either be Kansas or a bordering state, and none of the bordering states are especially compelling (although Missouri would provide St. Louis, so that's a solid theory already). Even if we don't demand that Smallville and Metropolis be geographically nearby to avoid a plot hole, we have to question why we would put it elsewhere. Clark Kent leaves home to do ... what? Is he already a seasoned hero as Superboy? Is he focused on living his civilian life or does he aspire to put on the cape? Is he following someone? Is he running *from* something? Different authors have their own ideas of this transitional period in his life, but the answers to these questions tell us what sort of journey he would undertake. If he's seeking generic "big city life", most people travel to the nearest regional hub. If he's looking for a city with some unique trait, like Nashville for country music, then we'd have to ask what's so unique about Metropolis. It's possible Clark has no motivation. Maybe he would have picked any city, and the Daily Planet happened to give him an internship - then you could put Metropolis anywhere, but that's boring. If this was Superman 1938, I might say that Metropolis is the biggest, richest city in the country by far, and that's enough reason to draw him. But no, we've established that there are several cities in this America that can fairly think of themselves as greatest by their own criteria. If he's looking for crime to fight, well, he'd probably come to Gotham or Hub City. Let's assume the Kents have told him from infancy to avoid Gotham City on principle. I don't have a complete concept for 'my' Superman, so I can't use his intentions as a compass. Instead, I'll fall back on my instinct, that it's in Kansas, and build from there. I do like Kansas for being in a part of the country without competing huge cities. But then again, there's reasons why Kansas doesn't have huge cities, like a lack of water routes. So we have to justify its success while giving it enough distinct flavor and texture to thematically match Gotham City. That's a tall order, though I have a few ideas. Smallville, the TV series, was the only one to make it seem like Smallville was a stone's throw away from Metropolis. Every other incarnation has put Metropolis in New England, requiring a flight, bus ride, or train. Metropolis, at least in quite a few incarnations, was considered 'the city of tomorrow'. Where better for a man who can fly and is a symbol of hope? Gotham, in contrast, is a city that doesn't ever want to let go of its past, and clutches onto it, whether through its traditions, its long memories of past transgressions, control by the mob, or even its architecture. Whereas Gotham architecture is all Gothic and Victorian, Metropolis architecture is Art Deco and Futurist. Unless you're against the idea of a beacon of hope Superman, the relationship with Metropolis is a natural one. This is why in Gotham Central, Renee Montoya points out to Maggie Sawyer that coming out as a lesbian in Gotham is entirely different from coming out in Metropolis. Metropolis embraces social change, while Gotham doesn't. But, to quote the folks at DC, 'Metropolis is New York during the day, Gotham is New York at night.' Note that both in the 1930s comics have plenty of bank robbers, mafia, gangsters, etc., but that Superman eventually moved on to dealing with giant robots, mad scientists, and other things that seem more prone to happen in Metropolis than in Gotham. If you wanted a reasoning behind it, I guess you could say Metropolis is the city that attracts investors in inventions and those that want to make the world better(whether for themselves, like Luthor, or for everyone). I'd imagine that the 1930s Metropolis would embrace New Deal policies and being rather left in general, while Gotham would hate the policies and be rather right wing in general. The idea of the site of St. Louis being the site of Metropolis is kind of growing on me- that or Chicago. They're both natural places for a rich, successful city to exist- Chicago more so, but there are good reasons St. Louis became a transportation hub. Hard to square Gotham being Right-wing with the Joker always managing to avoid the death penalty. This is why that for the longest time, Joker was untouchable due to his diplomatic status as an ambassador for Iran. I'm not kidding. Yeah, I remember the Iran thing. But, that makes me wonder what role the Joker plays in the 1939 continuity. I'm not fully caught up on Swimming in the Styx, so apologies if I missed something, but he has basically not come up at all in this continuity IIRC. In a way, that's refreshing- the Joker is a great villain, the definitive Batman villain, but for that very reason, he gets used a lot. But at the same time, I feel like fighting the Joker is sort of a rite of passage for any incarnation of Batman. The Joker hasn't appeared in Batman 1939, nor, as things stand, will he. I don't feel obliged to try something radically new with each character. Waller, for instance, acts close to canon. However, I do try to do something interesting with each character, which can be to make them new, or to take an old version and watch them react to a new environment. As you said, the Joker gets used a lot, so there aren't many new approaches to try. And more than most characters, the Joker acts, he doesn't react. So putting him in a new environment isn't as refreshing. And he doesn't show many human concerns, which limits dramatic opportunities. If someone else wants to write him in, I've always been open to making this a collaborative setting. Next chapter's almost ready. It's going to be my Peptuck-ingist ever. Buckle up. Thought of the day: Lex Luthor once ran for president and won. The authors of that fictional story showed that he succeeded thanks to an expensive campaign to convince the public that he was not merely brilliant and well-mannered, but ethical, public-spirited, and compassionate. The reader knows Luthor is actually a heartless businessman who only stays out of jail by the skills of his legal team. There are countless evil schemes with his fingerprints on them. Since he seemed so transparently shady, it used to be my opinion that his election as president was the most unrealistic part of the story. These days, I believe the most unrealistic part was that he felt a candidate needed to look ethical, public-spirited, compassionate, well-mannered, or smart. As I commented in the review thread for Kingsman II, a President has to be ridiculously cartoonishly evil to seem implausible these days. Trump has really... "raised" the bar. To be fair, Luthor was a genius inventor who used his inventions and genius to transform Metropolis's economy and make his company prosper, with numerous products to show for it. As opposed to someone who has had bankruptcies with every business. 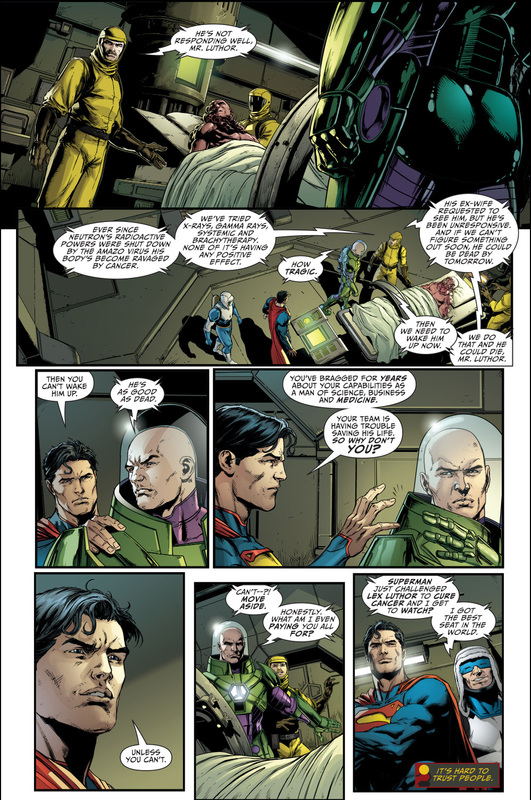 Luthor is just such a selfish git, that proper motivation is the only way to get him to do so, such as Superman saying that Luthor can't cure cancer, so he does so. He then proceeds to weaponize it, because it's Lex Luthor. Old school comic books must have the densest use of exclamation points of any art form. Arguably- but then, Lex Luthor was never going to be able to follow a populist route to the presidency. He can't convincingly roleplay a crude, larger than life goon with an effective IQ of 80 in all areas not directly related to his business. Lex Luthor could never be Donald Trump, precisely because Donald Trump is unfit to polish Lex Luthor's shoes. * He couldn't be Donald Trump. No, he had to be Mitt Romney, only winning. *You thought I was going to say 'shiny bald head.' You all did. After Batman and Wonder Woman visited the Consulate and reviewed the footage of their espionage, Batman said their next lead was Amanda Waller. If Captain Trevor was a political weapon in a brewing military coup in Argentina, and Waller had put him there, she clearly knew the situation. Wonder Woman asked how they would find Waller. The inscrutable lady seemed to travel often. Batman answered that he need a day to find her, and they parted ways. Batman had asked Wonder Woman after their first evening working together how she had been living in the city when she wasn’t investigating, and she had told him that she was sleeping in a nearby park, and she still had a few dollars left for food. He had simply given her the address of a boarding house, saying that the owner owed him a favor. The owner proved as good as Batman’s word. Diana had a room with a bed of her own, and two meals a day were on the house. She slept much of the day after her visit to the Consulate. She knew she would need her energy. And without Batman, she had no obvious way of finding Steve. And if she wasn’t finding Steve, she didn’t want to do anything. In the daylight, Diana felt nothing but useless nerves and fears. She hated that. Even if she succeeded at her immediate mission – and that seemed less likely by the day – she had clearly failed in securing the favor of the United States for the Amazons. It took all her discipline to focus on one problem at a time. She said, “Wait!” but it was too late. Batman was already descending a drainpipe to a dark alley. His car was parked here, a forgettable brown Packard. Wonder Woman followed but refused to get in without an explanation, so Batman explained. Batman entered the car. She followed. They put on their seat-belts. The First Special Platoon marched through one of the few rainforests in the world closer to a polar circle than to the equator, and it was cool this winter. But like all rainforests, there was still plenty of rain. The Platoon had set off at dusk, and now they marched through the cold, wet night. They wore civilian coats in the local style. This was both a war crime and slightly warmer than their proper uniforms, though the coats were soon so soaked that they hardly felt the difference. The foliage was too thick to see the stars, and every fat frond a man brushed against dropped half a bucket of collected rain on his head. The forest had millions of fronds. Each man gripped the pack of the man in front of him, invisible at arm’s length, otherwise he could disappear in three bad steps. The forty-three men marched through the mud in this awkward chain. They weren’t allowed lights, and talking was forbidden. Only the point man was allowed a light. Every few minutes, he would tap the arm behind him to stop the column, then he would crouch and hold the sputtering flame of his lighter up to his compass, concealing the glow with his body. And so they trudged, mile after chilly mile, until just before dawn. Then the front of the column heard the gush of a river. Enough light slipped though the trees that the men had become gray silhouettes. The point man gestured to lay prone. The gesture was repeated down the column, and the Platoon dropped into the grass. Lieutenant Slade Wilson crawled forward. The point man pantomimed hearing the river. Wilson picked two men to follow him. They crawled ahead of the column until they reached the bank of the river. It looked shallow enough to wade and thirty yards wide. More of a creek, really. Wilson took out his binoculars and studied the far bank. The forest was thin there, and in the center of the partial clearing was a camp with a wooden wall - the Rio Apiculata garrison. The river bent around the clearing, surrounding it on three sides. He sent one of his men back to bring up the Platoon. That gave him a minute to think. Lieutenant Wilson was confident that his men could take the outpost quickly and with few casualties. But this wasn’t an assault, it was a prisoner rescue, and that complicated matters. It was impossible to know how the garrison would react if attacked. They might might execute the prisoner or retreat with him. Wilson had counters for these risks, but they had their own dangers. He could try to sneak inside with a small team to secure the prisoner without alerting the captors, and he could flank the rear paths to block a retreat, but both options removed men from his main attack. Of course, no matter what he did, the brief might be wrong and the prisoner might be somewhere else. Such was war for a field commander. When the rest of the Platoon arrived, Wilson ordered Private Haslett and Corporal Wade to circle around the garrison and cut any telegraph lines they could find. The pair set off through the brush in opposite directions. Wilson gave them six minutes, then he led his platoon across the river. Two by two, they crawled into the current, holding only their faces and rifles above the water. After hours in the rain, being submerged made their clothes only slightly more wet, and the fresh current washed off layers of mud. The weight of their kit kept the troops from being too buoyant, so most were able to cross the river in a crouch. Wilson and the taller men had to improvise an awkward duck walk to stay low, practically shuffling on their knees. They could see the outline of the sentry in the garrison’s watchtower, and the men froze if they thought he turned their way. This was always a paranoid guess, as it was impossible to see the sentry clearly. It took almost a minute for each pair to cross and find concealment on the far side, so the entire maneuver lasted a third of a hour. By then, the first glow of daylight appeared over the trees. Wilson wondered whether the Argentines played Reveille. If they did, he hoped the bugler slept late this morning. It’d save the poor boy’s life. Now the Platoon was nestled along the far bank, a stone’s throw from the twelve foot garrison wall. There was no entrance in sight. Wilson ordered a squad to follow the wall until they found a gate. When the Platoon reached the prisoner, it would be much easier to bring him out through an entrance than over a wall. Wilson pointed at two big men to follow him. The trio crept to the wall. Wilson slung his rifle over his back. The two men grabbed Wilson’s ankles and hoisted him up. Wilson grabbed the top of the wall and swung himself over. He dropped and landed quietly in the grass. There was no one to see him. He moved behind a cabin and made a bird call. A moment later, another man climbed over the wall. Then another. Corporal Wade walked through the trees, well beyond the edge of the garrison clearing. In the early light, it would be easy to miss any telegraph lines overhead. He moved carefully, looking up as often as forward. He judged that he had circled at least halfway around the clearing by now. So far, no wires. Perhaps the garrison really was that isolated. While looking up, he tripped over what felt like a log. Corporal Wade got to his feet and glanced back. The log rolled over and looked up at him. He stifled a yell. Around him, ten more armed men rose from the mud. One was much larger than the others, eight feet tall and built like a grain silo. The nearest mud man lunged at him. Corporal Wade spun his rifle around and fired. Private Floyd Lawton was the Platoon’s designated sharpshooter. Hiding in a tall tree outside the wall, he observed the few moving bodies in the camp. He saw the sentry in the watchtower, two more standing guard at a secondary entrance, and a few others, perhaps cooks or messengers, pacing in and out of doors. When he heard the rifle shot beyond the clearing, he didn’t know who had fired or why, and he didn’t hesitate. In a smooth movement, he lined his sights on the watchtower sentry and shot him in the chest. Then he shot the two guards at the entrance. The wanderers had taken cover, so Lawton steadied his sights on the door of the nearest barracks-looking building and waited. Seconds later, the door opened and a man in long underwear peeked out. Lawton shot him in the shoulder, and he collapsed inward. Another door opened across the path. Its shirtless occupant sprinted forth, but Lawton shot him midstride. Seven men of the Platoon had made it over the wall when they heard that distant rifle shot. Lieutenant Wilson waved the men forward, and they assembled into a pair of neat advancing columns that would make any drill sergeant proud. They jogged forward but kept their posture tight and steady above the waist and their rifles hardly wavered. The Rio Apiculata garrison was essentially two crossed footpaths housing fifteen buildings. Each of Wilson’s columns hugged a sides of a path, keeping close to the buildings. They killed anyone they found in brief, lopsided firefights. The early light produced countless shadows, and the drizzle still laid a gauze on the landscape, so these encounters were sudden, surprise affairs. It was difficult to judge whether some targets were even armed. At least a few were, as one of Wilson’s men was hit. They left him behind without a glance. As more of the Platoon arrived behind them, the new troops began securing the buildings. Two troops would kick open a door and yell a simple order in Spanish. If anyone inside looked dangerous, the troops shot him. Everyone else they forced to the floor. Two more Americans were shot entering buildings and another was wounded with a shovel. The squad who had been diverted earlier fought their way into the camp’s fortified main gate and held that post, losing a man in the process. While the first buildings were being cleared, Lieutenant Wilson reached a large locked structure near the center of camp. There had been a guard at its door, but the boy was gunned down in the initial skirmish. While his men continued though the camp, Wilson clubbed apart the lock and opened the door. He hustled down a row of cells. In the shadows of the last cell was Captain Steven Trevor. “Shut up.” Wilson peered around around the short hall, searching for a key. Gunfire popped sporadically outside. Wilson gave up the search and opened his coat. “Stand back.” He unholstered what looked like a fat pistol - a shotgun with no stock and a barrel sawn almost to the trigger guard. Wilson broke open the barrel, fished a cartridge out of a pocket, wiped off some grime, chambered it, closed the barrel, and cocked the hammer. Standing at a wide angle to the door, he grit his teeth and fired. The lock disintegrated. Captain Trevor briefly lost his hearing. Trevor got ready to fight, but he needn’t have bothered. The battle for the Rio Apiculata garrison was virtually over. The First Special Platoon had men watching all corners of the camp. Others herded surrendered Argentine soldiers into a circle on the ground outside their mess hall. Yet others tossed weapons from the the camp’s arsenal into a fire. Those in the Platoon with mild wounds were patched up and sent to the rear. The gravely wounded and the dead were carried out on makeshift stretchers. Wilson’s squad leaders saw he had found Trevor, and they ordered their men to finish up. The Platoon’s best Spanish speaker explained to the circle of seated prisoners that riflemen hidden in the trees would shoot anyone who tried to stand for the next hour. This speaker then pointed at a bell on the porch of the mess hall. Out in the forest, Private Lawton saw the gesture and fired twice. The prisoners heard two rounds strike the bell. None of them moved. As the Platoon finished the last tasks and fell into formation, the squads gave Wilson their report. They had suffered five casualties, ten more men had been tasked to move the causalities, and the two scouts sent to cut the telegraph lines had yet to return. That left the Platoon with twenty-six men plus Captain Trevor who was busy stealing some boots. The two missing scouts concerned Wilson, but they were expert trackers, and if they finished their sweep after the rest of the Platoon had withdrawn, they could hike back to friendly lines on their own. He gave the order to move out. It wasn’t until the second squad passed through the gate that the mortars struck. A chorus line of singing shells hit the front of the Platoon. Four men were immediately pulped, and two others were sent reeling and disfigured by the shrapnel. The rest reacted ably, spreading out, taking cover and trying to spot the assailants. Many withdrew behind the garrison walls, taking advantage of the firing platforms along the wall’s interior. Those caught outside made do with trees and ditches. Lieutenant Wilson screamed to make himself heard over the cries of the wounded, giving orders which his experienced troops had already started. He stayed in the a concealed corner of the wall and kept Captain Trevor nearby. One of his men called “Infantry!” a moment before a fusillade of rifle fire erupted from the trees on several sides. One of his men was hit, and the rest fired back. Wilson climbed a platform and peered over the wall. What he saw chilled his blood. Long rows of men in uniform hustled through the thin woods toward the garrison. He saw at least a hundred. Pockets of them collapsed as his own men responded with well-aimed counter-fire, but their few rifles could never hold back the wave. The approaching vanguard let out a battle cry, and blocks of men paused to fire at the garrison. Bullets ricocheted off the wall near Wilson’s head. He obligingly ducked. The gate faced north, but the Platoon ultimately needed to travel west. Wilson called to his senior sergeant to hold the line. Then he grabbed Trevor by the shirt and ran. The pair heard the heavy firefight behind them as they fled. By the time they reached the next wall, the shots had diminished but the screams were only growing. Wilson and Trevor knew it wouldn’t be long now. They clambered over the west wall and were spotted by a squad at the the edge of the attackers’ flank. Wilson and Trevor dived behind some bushes to dodge their incoming fire. Trevor guessed it was at least six against two. He thought himself a decent marksman for a pilot, but six to two were long odds. Then he remembered who he was with. Lieutenant Slade Wilson was the sort of warrior they wrote long poems about back in sword and castle days. He moved with a clean focus and precision that made other pros look green. Wilson rose, fired four rounds, then ducked. Trevor didn’t need to look to know that each had hit its mark. The two survivors offered some desperate return fire. Trevor crawled to the edge of the bushes and offered some blind shots of his own to keep them busy. Meanwhile, Wilson smoothly crept behind a tree, then leaned out and fired twice again. The incoming fire ceased. The pair ran, splashing through a river before Trevor realized he was wading in cold water. A wild round flew over their heads. They crested a small rise and Wilson turned. “Keep moving.” Trevor obliged and soon lost Wilson through the trees. Wilson aimed and gunned down the two nearest pursuers, making the rest duck for cover. One wasn’t ducking very carefully, so Wilson picked him off as well, then he dropped that rifle and retreated. Wilson had marched all night and fought through the morning. His joints were burning and his vision was blurring with fatigue. Meanwhile, his pursuers were recovering from his attack. They were fresh. They were pushing hard, and eventually they would catch him. Lieutenant Wilson ran through the forest, stopping at opportune points to turn and fire. The third time he tried this, he found a dozen men closing in. A bullet stuck him in the eye, and Lieutenant Wilson fell. Private Floyd Lawton was idly watching the circle of garrison prisoners when the mortars stuck. His treetop perch wasn’t positioned to see the gate, so he could only hear shells explode and imagine the carnage. His first incredulous thought was that the garrison had somehow sent out a very well-armed patrol before the First Special Platoon seized their camp, and now it was returning. He couldn’t see the gate, but clearly the prisoners could, and a few looked like they were about to make a run for it. Lawton coolly shot the first who tried, and the rest stayed put. He soon heard the echoes of an impressive gunfight. This was no returning patrol. He decided his talents could be put to better use elsewhere. He climbed out of his tree, ran thirty yards through bushes, then climbed another tree to reach sight of the battle. Here he saw a nightmare. Some defenders near the north gate were putting up an exceptional defense, but an overwhelming force was running out of the mist - at least a company’s worth. If his side had a few machine gun nests and a minefield, the Americans might have a fighting chance, but Lawton felt with grim certainty that the day was over. He considered leaving. He could make it back alone, live another day. But Floyd Lawton was a harsh, complicated man. Shrinks had fancy names for what he was, but laymen just called him cold. He didn’t have much concern for honor or aiding his brothers in arms. But he did value a mission. He liked having that purpose, and he liked to fight, and he liked to kill. As for his own death, he wasn’t a martyr, but everyone died eventually, and part of him felt it ought to happen at a place like this. That wouldn’t be so bad. So he stayed. He fired his crusty bolt action rifle at a pace trained men used a semiautomatic, holding back a prong of the assault through sheer attrition, at least for a moment. Then new bodies replaced the gap and he had to reload. He carried a big pack of ammunition for these occasions, but it wasn’t infinite. War wasn’t an equation to be solved, but a good sniper could usually pin down entire platoons or even a company. The sniper was a specter of invisible death which gave brave men pause. Coupled with the substantial threat from the other defenders, it was surprising that these attackers continued to charge with so little caution. Then Lawton saw them. Again. Out of the mists they paced. Three heads taller than a regular man, with chests and shoulders like cattle, Lawton saw five of them spread evenly across the enemy rear. The specimens he had seen before were stuffed into wool suits, but these fighters had thick kettle helmets and slabs of armor down their front. Each carried some enormous gun he didn’t recognize. They couldn’t be missed. Lawton decided to test that observation. The round struck the ogre in the jaw. It fell to a knee. The lower half of its face was a red mess. It touched the missing flesh in what might have been shock. But soon it was walking again. Lawton aimed the next round a little higher. It bounced off the beast’s thick helmet. The enemy’s front line reached the gate, tossing grenades ahead of them. The remains of the First Special Platoon finally began to break, and Lawton diverted his attention to the immediate threat. Some of the Platoon was running but a few stayed their post, weathering stupendous shrapnel and rifle fire, and even locking bayonets with the first foes to reach their line. Now more than ever, Lawton was in his element. The attackers could press through their losses when they had room to maneuver, but now they reached a the gate’s bottleneck. Lawton hardly aimed. He fired as fast as his weapon could stand function. His hands cramped and the bolt grew warm from friction, but he didn’t stop until his pack was empty. When he felt an empty bag, Lawton was lifted from his trance. He scanned the field: not one man of the First was standing. The attackers had clearly noticed him, but they seemed unsure how to approach a sniper. A few put suppressing fire in his direction. Then one of the giants jogged to the front. The big guy didn’t hesitate but plowed ahead, firing what proved to be a crew-sized machine gun across the tree line. Lawton didn’t need another excuse. He shimmied out of the tree, tossed his rifle, and retreated. When the Rio Apiculata garrison was attacked, el Coronel had been caught with his pants down. Fortunately, the invaders didn’t preemptively shoot the latrines, so he was allowed to surrender. The sudden capture of his base made him angry and ashamed, but he understood the reasons. Someone was after his American captain. Whatever their identity, it was a strike he had anticipated. But these newcomers, his rescuers? He didn’t know their intentions. How had two opposing forces chosen the same objective and planned their mission down to the same hour? That was unbelievable. After the new arrivals had ruined the original attackers, a squad of them walked through camp to the waiting captives sitting in a tight group in the dirt. When the captives saw the newcomers approach, el Coronel’s men saw that they wore the uniforms of the Argentine Army, and they began to stand and cheer. El Coronel didn’t share their optimism. The other garrisons in this region were his allies, but there was too much unexplained. Instead of joining in the cheers, el Coronel looked around for his officers. He had to speak with them quietly and soon. But the cheers ceased, and every man was silent. El Coronel turned to see what had silenced them and found two enormous men carrying heavy belt-fed guns come into sight. He was about to order his men to run when the two Germans opened fire. Captain Steven Trevor stumbled through one of the few rainforests in the world closer to a polar circle than to the equator, and it was cool this winter. But like all rainforests, there was still plenty of rain. A drizzle began shortly after he lost contact with Lieutenant Wilson. Trevor wore a simple tunic and trousers from his latest imprisonment. The outfit had been comfortable in his dry cell, but here in the cold, it felt like tissue paper. Each raindrop soaked to his skin in an instant. Also, his boots were a size too large. One size difference was really quite lucky considering the lottery involved in stealing shoes in a hurry, but the difference made travel that much more miserable. The big boots sucked into the mud with every step, and his feet slapped against the boots’ insides when he tried to pull them out. When he was initially freed, sheer panic had lent him a bucket of energy, but now panic was starting to call in its debts with interest. He couldn’t run any longer, and walking was increasingly difficult. The wet cough from his sickness was returning. He couldn’t remember where he was supposed to go. The noise of the forest was overwhelming. When his face hit the mud, he couldn’t feel it. Later that morning. The Fremont Hotel. Washington D.C.
Amanda Waller sat on a chair in her hotel suite, drinking a bottle of wine. She finished a third of the bottle in one swallow and wiped her mouth with the back of her hand. Waller hadn’t touched alcohol in years. With that remark, a billowy mist seeped from Waller’s hands and face. It formed into a small blond lady with pale skin and many tattoos, including one across her collarbone that read Kinder Küche Kirche. Waller was finding it difficult to lift her head, so her eyes focused on this tattoo. Waller tried to scowl but felt nauseated at the effort. She could hardly keep her eyes open. The lady stretched and cracked her knuckles. Waller noticed that the knuckles on one hand spelled BLUT and the other spelled BODEN. The lady looked immensely pleased as as she entered the suite’s miniature kitchen and found the gas stove. As Waller fell asleep, her last sensation was the smell of smoke. You know, it occurs to me that you can probably answer just about any question with "I'm Batman", and it works. He had to get ready for that eyepatch somehow. I always preferred Oliver giving it to him, but then, he's the Emerald Archer's best villain. The question would have to be about the answerer's own behavior. You couldn't use any random question about anything. "What is the atomic weight of cesium?"